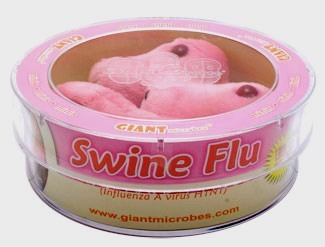 Does Influenza Evolve in Multiple Tenses? The past may possess a power greater than prologue. Anyone with a social networking account knows that. All of a sudden you find yourself daily interacting with people long thought boxed away. People mature, yes, but sensibilities remain largely intact and an old year, fine wine or vinegar, pours back up into the bottle. “The past,” as William Faulkner diagnosed it, “is never dead. It’s not even the past.” Living in multiple tenses, in what we characterized in the previous post as Louis Althusser’s ‘historical present’, can be exhilarating or exhausting depending on the day. That kind of time travel may be influenza’s bread-and-butter. Strains of the bug may retain, and strategically exploit, the capacity to evolve molecular characteristics of bygone eras. To address whether exposure to previous H1N1 strains, as far back as the 1918 pandemic, protected humans from the worst of new influenza swine flu H1N1 (2009), Yasushi Itoh and colleagues exposed the new virus to influenza antibodies circulating in humans of different age groups. Only patients born before 1920 expressed the antibodies that could neutralize the new virus. That is, the new H1N1 appeared to be expressing epitopes similar to those of the 1918 H1N1, antibody targets to which very few living humans could immunologically respond before the latest pandemic. Although influenzas–with life cycles of only a few days–evolve from infection to infection, the molecular constraints upon, and opportunities for, influenza evolution may extend in this case back nearly a hundred years. That’s the viral equivalent of a geological eon. Influenza’s evolutionary history is riddled with such parallelisms, arising when independent lineages evolve similar adaptations above and beyond chance alone. The parallelisms may accrue from more than mutational dumb luck, although the numbers involved in influenza infections could very well permit such raw selection in principle. Something other than natural selection? We can hypothesize that in drawing upon the structural constraints that shaped previously evolved responses, the genome engages in a type of cognition. At the risk of anthropomorphizing a virus, a cognitive influenza can choose, depending on its context, among a variety of genomic responses. Unlike most molecular work, thinking viral evolution algorithmically converges on the same or similar phenotypes via random mutation and raw selection, we hypothesize here that the convergences are context- and path-dependent. In other words, the effects of the agro-ecological historical present we discussed in the previous post may be fundamental to the evolution of livestock pathogens such as influenza. The very real presence of an agriculture’s past in today’s landscape, albeit transmogrified by waves of cultural re-appropriation and re-emphasis, may offer pathogens a hook on which to draw upon their own histories. How so? We can hypothesize a variant of Conrad Waddington’s ‘genetic assimilation’. In Waddington’s assimilation, an organism’s behavioral response to the environment is canalized— incorporated—into the genome over a number of generations. The new genotype will thereafter be expressed even when the environment changes. In our version of assimilation, the canalized response is incorporated but hides when environments change remaining a potentiality even generations later as an open-ended polymorphism. Again, how so? By what mechanism would such polymorphism be tapped? The genetic variation within any local population may be greater than what organisms actually express in the field. A local environment may select for characteristics consonant with the expression of only a limited genetic combination from a greater cryptic reservoir. Once the environment changes, however, that reservoir can be drawn upon. In effect, the hidden potentiality may act as a kind of genetic archive from which to reconstruct relevant adaptations or converge on related ones once they are again needed. A viral adaptation in the archive associated with a host switch routinely undertaken over hundreds of years—say, duck to human—may be revisited if only by way of the architectural constraints canalized on the genome and on the emergent biochemistry of the proteins produced. Such constraints are embodied by stereochemical relationships among amino acid residues, path-dependent epigenetic and biochemical pathways across genetic loci, and a compensatory evolution wherein changes in one amino acid select for changes in another. Whenever the pathogen is confronted with elements of a previous era’s agro-ecology, the constraints together channel viral expression to what the virus evolved previously as the ‘right’ amino acid combination. That’s the ‘historical’ in the historical present. At the same time, the evolutionary trajectory through the combinations of possible phenotypic expression may depend on the current mix of agro-ecological actors and opportunities. The successful virus must step through a unique combination of changes to ‘solve’ the new matrix of agro-ecological relationships as they are presented across the landscape. That’s the ‘present’ in the historical present. We have here, then, something very different from the algorithmic approaches to influenza’s molecular repeats. The virus evolves by more than just mutation-selection to immunological or prophylactic environments ‘from below’ in the immediate time interval. We hypothesize the virus also expresses a genomic cognition that permits a choice in emergently archived host- and niche-specific characteristics asked of it ‘from above’. Such cognition may help explain influenza’s capacity to succeed in agro-ecological niches defined by shifting geographic mosaics of old and new forms of farming. Although the mechanisms for such a molecular cognition require further elucidation, including its capacity in the face of environmental fluctuation, it appears influenza can straddle past and present. The duck-human interface virologist Kennedy Shortridge proposed as the means by which influenzas have long seeded human outbreaks across southern China appears to have undergone a fundamental shift once intensively farmed livestock were added. But virulent influenzas selected in such intensive livestock operations may be able to avoid burning out by switching to free-range ducks that have been feeding in local waterways and on waste grain for hundreds of years. It would appear, then, that across such a landscape everything old for influenza is new again. This entry was posted on June 20, 2010 at 5:11 pm and is filed under Ecological resilience, Evolution, Influenza with tags agro-ecology, compensatory evolution, Conrad Waddington, genetic assimilation, genomic cognition, historical present, Influenza, Louis Althusser, natural selection, parallelism. You can follow any responses to this entry through the RSS 2.0 feed. You can leave a response, or trackback from your own site.